25182 marshalls petrol tankers at St Pancras on December 6th 1980. The nineteen year eleven month career of D7532/25182 was spent allocated to London Midland Region depots, with a bias to depots in the southern part of the region. Dual brake equipped (May 1978). Time between last Classified repair and withdrawal: 79 months. August 1969 to London Division (D01). April 1972 to Birmingham Division (D02). 25182 was the 230th Class 25 withdrawn, one of five retired during January 1985. After withdrawal 25182 was stored at Toton. On March 25th - 27th 08095 & 25182 were moved from Toton to Swindon picking up 25076 & 25218 at Bescot. 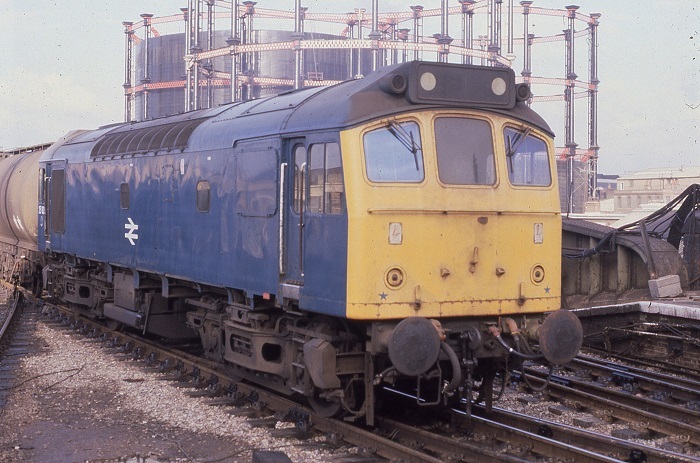 25182 was scrapped at Swindon by the middle of August 1985. Photograph courtesy Ian Hammond. 25182 stands pretty much intact at Swindon Works on June 18th 1985. 25182 did not linger to long at Swindon Works, by the middle of August 1985 it had become just a memory. Noted Crewe Works February & March 1970. Noted Derby Works May 1978 (included fitting of dual braking equipment). Noted Derby Works March 1982 (N1 repairs). Noted Derby Works October & November 1983 (N4 repairs, traction motors). The frames were laid down for D7532 at Derby Works during November 1964 with the D7532 delivered to the Nottingham Division (D16) during late February. On July 3rd D7532 was noted through Faversham with the ten coach 13.44 Ramsgate - Nottingham Midland passenger, a regular summer weekend working more frequently hauled by a Peak. Two weeks later (17th) the roundtrip Nottingham - Llandudno Town was worked by D7532. D7532 was noted at Derby Works during July. 7532 visited Derby Works during November. After four years on the Nottingham Division 7532 was transferred to the London Division (D01) during August. On June 29th a roundtrip Wellingborough - Brighton day excursion was worked by 7532 & 5202. The 07.35 Nottingham - Llandudno Town and 13.52 return were worked by 7532 & 5269 on July 19th. 7532 visited Crewe Works during February & March. 7532 was a little off the beaten track on January 22nd when it visited Lingfield, via Oxted with a special freight from Mostyn. Condition August: two-tone green livery with full yellow cab fronts, no blanking plates, hand/footholds plated over, engine exhaust in original position, straight sided sandboxes, three rung bogie mounted footsteps, 'D' prefixes present. On September 26th 7532 worked the morning Carlton Sidings/Manvers Main - West Drayton, a working booked for a Class 47. During April 7532 was transferred to the Birmingham Division (D02), returning to the London Division (D01) in August. On April 25th an early morning Coventry – Thames Haven empty oil tank train, hauled by E3083 derailed on the slow lines at Bletchley station, causing considerable damage to the platforms and some of the structures. For the clean up 7518 arrived with the Bletchley crane, and 7532 with the Willesden crane, full services did not resume until May 3rd. 7532 was noted on the 13.20 Wolverhampton - Chester on July 1st deputising for a failed diesel multiple unit. July 10th found the southern end of the WCML blocked after a derailment near Bletchley. All lines were affected just before noon when a coach became derailed, damaging a stanchion, bringing down the wires and finally hitting the flyover. Six down trains were trapped for two hours before being slowly worked past the accident scene. Two up trains were diverted from Bletchley into Marylebone, using 25182 & 25310 and 25309 & 25324, other services used St Pancras, including one hauled by 50036, whilst Paddington and Kings Cross dealt with the overflow. On September 14th 25182 & 25120 worked the Derby - Norwich - Yarmouth - Norwich - Walsall diagram, a passenger mileage of 370 miles. 25182 worked a Nottingham - Lincoln parcels on May 9th. 25182 was transferred to Crewe during January and by August had moved on to Cricklewood. On June 12th 09.20 the Manchester Piccadilly - Yarmouth was worked to Lincoln Central by 25182 & 25195, the return leg was handled by 31176 after the Class 25s were failed. On July 29th 25182 & 25189 assisted the 11.40 Euston - Wolverhampton between Bletchley & Northampton due to the power being off for engineering works. 25182 worked the 15.10 Aberystwth - Shrewsbury on August 2nd. 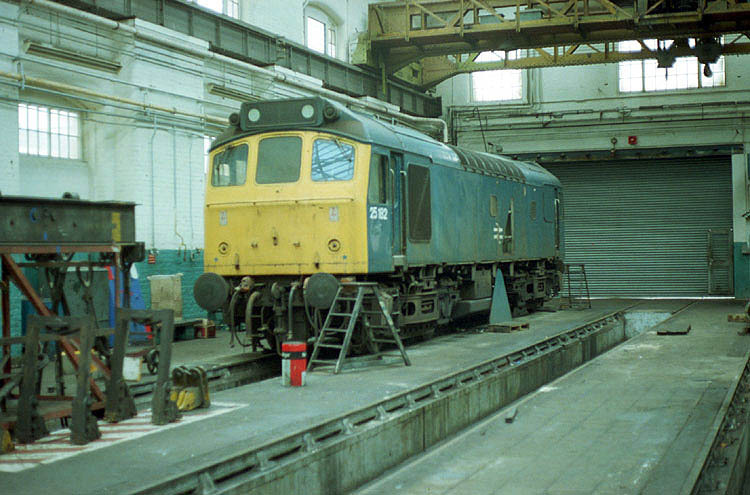 25182 was at Derby Works for classified repairs during May, this included the fitting of dual brake equipment. On December 23rd a short freight saw its brakevan become derailed south of Leagrave. The locomotive, 25182 remained on the rails, but late afternoon services to and from St Pancras were disrupted. During the last week of January 25182 was well traveled, being in charge of the 08.25 Bridgwater – Baglan Bay on 22nd and handling a Tyneside – Kings Norton empty car special on 28th. 25182 worked a Leicester - Didcot parcels on March 6th, being noted later on stabled at Oxford. On March 11th 25182 assisted a Cardiff - Newcastle service from Gloucester to Birmingham New Street after 47507 expired. 25182 was stabled at Worcester shed on April 7th. The last weekend of May proved busy for 25182 & 25200, on May 30th they worked 08.35 Derby - Yarmouth (to Norwich) and 14.20 return, the next day they covered the 08.34 Leicester - Skegness and 18.30 return. A round trip mystery excursion from Wellingborough to Aberystwyth on June 14th (or 16th?) was hauled by 25051 & 25182, for a total of 382 passenger miles. 25182 was noted at Carlisle station on June 21st. On October 18th 25182 & 25106 were in drag mode on the WCML between Stafford & Rugby, assisting the 07.05 Blackpool - Euston when the power was off for engineering work. Photograph courtesy Phillip Moore. 25182 awaits attention in 8 Shop on March 20th 1982. 25182 received an 'E' exam at Cricklewood during February. 25182 assisted an ailing electric multiple unit between Milton Keynes & Birmingham New Street on August 20th, two days later (22nd) it worked the 02.35 Euston - Bletchley. Seaside visits continued with 25182 & 25083 on a charter Euston - Aberystwyth forward from (& returned to) Nuneaton on September 5th. Two weeks later on September 18th 25182 & 25235 worked the 10.10 Euston - Aberystwyth forward from Birmingham New Street returning with the 16.05 to Shrewsbury, on this return leg 25182 proceed alone from Machynlleth with four coaches. Another gas pipe project in November brought pairs of Class 25’s from Leith South to St Helens or Warrington, the trains of twenty six bolsters required banking between Garswood & Shaw Street. Noted on November 3rd were 25176 & 25078 banked by 25109 whilst the next day produced 25059 & 25180 banked by 40090. 25182 was the Manchester Victoria pilot on the evening of February 3rd. April 29th found 25182 in charge of the 18.18 Birmingham New Street - Norwich, it is not certain how far the locomotive worked this service. On May 4th 25182 was noted shunting at Stamford goods yard. At the end of October 25182 was noted at Derby Works receiving three traction motors from 25146. 25182 was on empty coaching stock duties at Euston on January 6th. 25182 was stabled at Cockshute on a very dull February 25th. After seven and a half years at Cricklewood 25182 was transferred to Crewe, this was its final transfer. 25182 was noted passing through Manchester Victoria on March 6th with a freight. On April 24th 25182 was stabled at Nuneaton station. The 17.15 Market Harborough - Bedford diesel multiple unit on May 22nd got no further than Wellingborough before requiring the assistance of 25182 through to Bedford. 25182 was noted at Luton & Stonebridge Park with six cement tanks on August 7th. 25182 & 25224 were noted passing Abergele on August 31st with ballast empties for Penmaenmawr. On September 29th 25182 assisted the 06.28 Lincoln Central - Crewe diesel multiple unit forward from Stoke on Trent. 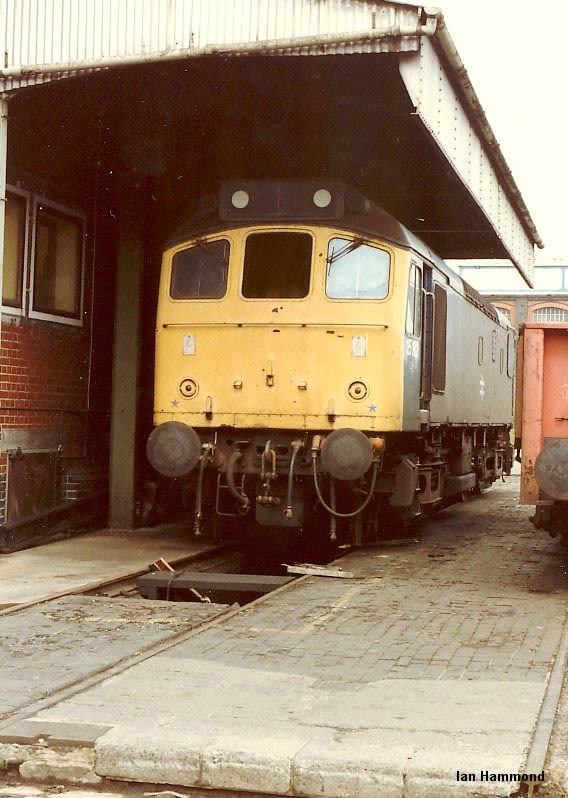 As nothing was available as a suitable replacement, the Class 25 and the diesel multiple unit worked the return Crewe - Derby, where hauled stock was waiting to cover the 13.20 to Crewe. It came back with the 15.20 to Lincoln, before ending the day hauling the 18.45 to Derby, a passenger mileage of 266 miles. 25182 was stabled at Severn Tunnel Junction on October 8th. On October 9th 25182 worked the 18.45 Lincoln St.Marks - Derby. On December 29th 25182 & 25209 assisted the 09.01 Rock Ferry - Chester diesel multiple unit throughout, this was possibly 25182's last passenger working. On an unidentified January day 25182 & 25134 were noted southbound at Hereford with a train load of steel coils. 25182 was withdrawn on January 21st 1985. No.2 cab front large paint chip underneath handrail near center of cabfront: December 1980 until withdrawn. Page added December 31st 2004. Last updated April 5th 2019.